Your card is adorable Pat, the colours works perfectly together and the papers are beautiful. I love the cute image. this is such a darling card, hun! I love your zesty colours Pat, perhaps a little reminder of Spring days. Oh my word Pat this is absolutely delightful, what gorgeous fruity colours they are so reminiscent of Spring, the image and card design look superb. Beautiful zesty design, wonderful colouring and great design. 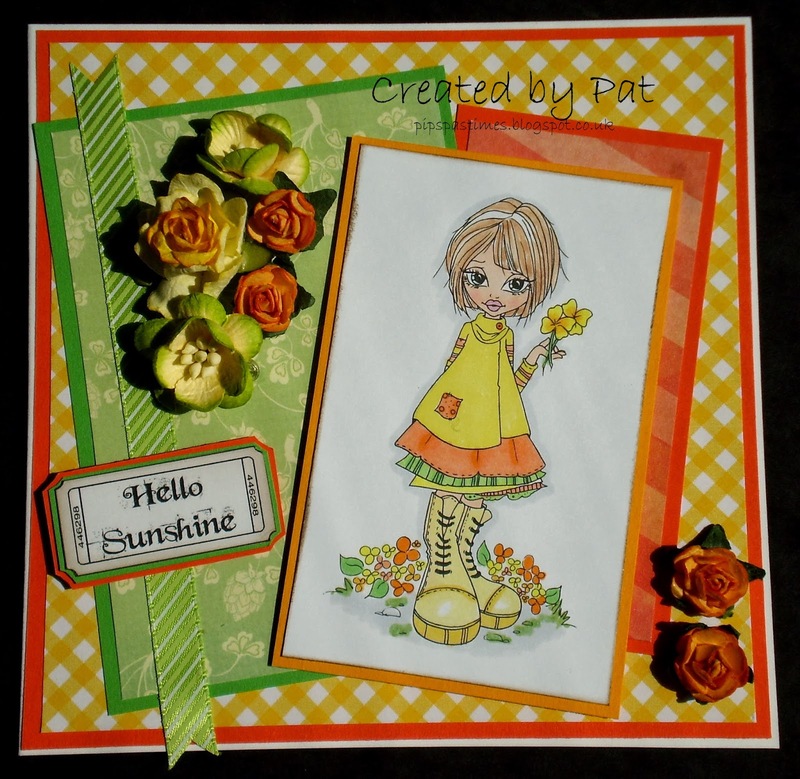 Thank you for joining in the Crafty Boots 'Sunshine' Challenge. Oh wow. Love that colour combination. It's a gorgeous card. Your card looks like sunshine, love the bright and happy colors. SC has such lovely images and you colored her beautifully. I am ready for Spring myself, but shouldn't complain even though we have had super cold temps - not much snow. It will feel like a heat wave today. Mid 50's, yeah! Pat, the colors and flowers on this pretty card are perfect! Love the sweet image too. Thanks for playing in the Pattie's Creations Challenge! Loving these zesty colors, especially this time of year...gorgeous! Great Color COmbination. Looks great. Thanks for joining us at the Fairy Tale Challenge! I do believe this is one of my favorite color combinations. Zesty! Love the image and your colorful card!